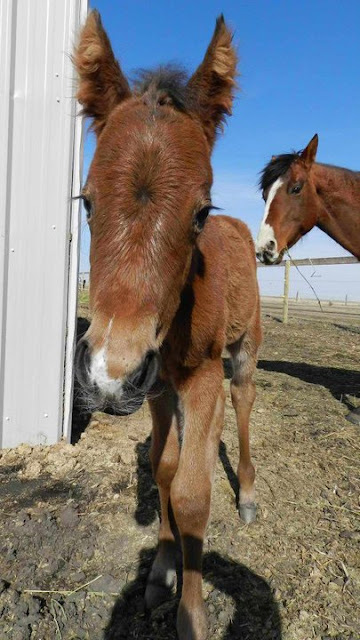 In the early hours of the morning on April 25th, Socks had a little bay filly. 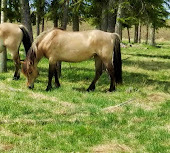 We didn't realize she was pregnant, we had no reason to think that Fonda had been out with the mares and Socks didn't show any signs of pregnancy. I got the call at 7:30 in the morning that we had an addition to our family. I dragged my mom out to the stable and met Artemis for the first time. She doesn't have the trademark blaze that Socks and Cassidy share but she is the exact same red that her mother is. She has no white feet, a white snip and three white hairs on her forehead. Even at just a few hours old, she was so much friendly than Cassidy had been for the first year of her life. She wobbles over to see what you're doing and already enjoys the taste of oats. She's very curious and is learning to like human attention. She loves being brushed and hiding behind her mother. Artemis looks almost identical to her brother, the few differences being her snip is bigger than his, his star is bigger than hers and of course, she's a girl and he's a boy. He also has a back sock, and right now it doesn't look like she has any socks. We think Hades will turn out to be seal brown like their father and Artemis will be bay like her mother. When I write that out, it sounds like a lot, but to look at the two of them now, they look identical. I couldn't decide on a name in the beginning. I wanted to stick with a Greek name since her brother is named Hades, for the god of the underworld. It was between Artemis, goddess of the hunt and my favourite Greek god and Arwen, yes, the elf from Lord of the Rings. As lame as that is, I love that movie and she's one of my favourite characters. But in the end I decided on Artemis. My dad hates it but I wanted to keep with the Greek god theme. I'm glad I did and although she's a little small and cute for it now, I think she'll grow into it. I could probably go on forever about her even though she's only a day old. She likes to wander away from her mom, completely freak Socks out and then wobble back as if nothing happened. If you kneel down she can't stop looking at you and she tilts her head in the most adorable way. She can't figure out how to lie down properly yet, and just folds her front legs up and flops down. She fell asleep on my foot today when we were inside the shelter. She's adorable and takes after her father, not her mother so far, although she does have her mother's little head nod of attitude going on. We're going out tomorrow to see her again and I can't wait! Our landlord let the stud out with the mares while my dad was on vacation. I'm still a little angry, but I do love Hades and Artemis. Her mother is a registered Quarter Horse and her father is three quarters Canadian horse. His mother is half Canadian, half Quarter horse, and his father was a registered Canadian. With all that, I just say she's a Canadian/Quarter Horse cross.